You'll be £19.99 closer to your next £10.00 credit when you purchase First In, Last Out. What's this? This is the astonishing tale of two episodes in the life of Colonel J P Cross, jungle fighter and linguist extraordinaire. As a young officer at the end of the war against Japan in 1945, he took part in counter-insurgency operations against the Vietminh at a time of chaos and confusion. Sent to the area to help disarm the defeated Japanese, Cross found himself commanding a battalion of the very same troops against the Vietminh. That period provides the backdrop to Cross’s experiences as British Defence Attache to Laos between 1972 and 1976. His mastery of the languages of he region allowed him rarely-accorded access to high Laotian political circles. Allowed to wander at will even by the Communists, he was in the unique position to survey the subterfuge and rivalry surrounding an overlooked yet fascinating sideshow to the Vietnam War. A remarkable man, J P Cross provides an absorbing account of his life amidst the cut and thrust of Laotion politics. First published in 1992, this welcome new edition describing two episodes in the authors extraordinary career has an introduction by Hew Strachan. 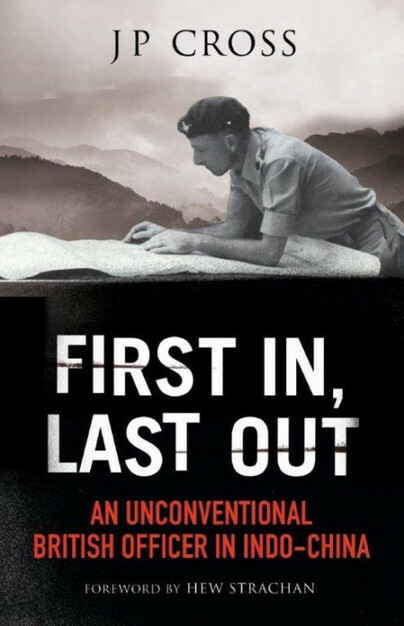 The book 'First in, Last out' by Col J P Cross describes two episodes, one as a young officer taking part in counter-insurgency operations in French Indo-China, and later, as the Military Attache in Laos. A unique position to watch, hear and gather military intelligence while under diplomatic cover. Some fifteen Embassy's were based in Vientiane, the country's capital: all with a quota of spooks. It was a city of intrigue and rivalry. In the late sixties, Vientiane was more a large Asian village and took only ten minutes to walk from one side to the other. The town was packed with staff from the Embassies. Almost everyone carried side-arms, and in the warm evenings, politics forgotten, foreigners would gather at Lulu's, drinking and listening to its owner Lulu, previously a madam with the departed French foreign Legion, sing slow, sultry French songs. However, unlike his counter-parts, Cross didn't visit the flesh spots but made a point of learning the language, and would stop and chat with the local people. He didn't drink, was a bachelor and always immaculately dressed, with his dog at his heels. He was the image of a very British Colonel. He gained the confidence and trust of local politicians,and developed a relaxed friendship with Russian and Chinese Embassy staff which helped him to produce top quality intelligence for his masters in London. He retired to Nepal and was a member of the university staff at Kathmandu. In 1970, The Economist described J P Cross as ‘one of those gifted, dedicated eccentrics that the British Army has the habit of spawning.’ In his career spanning 40 years, Colonel Cross commanded a rifle company during the Malayan Emergency and the Border Scouts in Borneo, directed the British Army Jungle Warfare School and recruited Gurkhas for the British Army in Nepal.